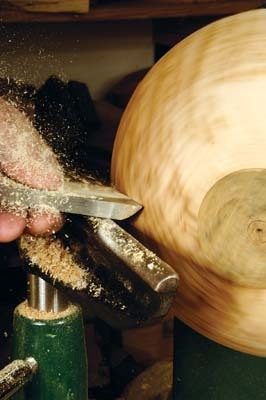 So far in our basic turning series, we've shown you the tools you'll need, how to hold the workpiece on a lathe, and how to sharpen those tools - now we'll show you how to use your tools for turning. 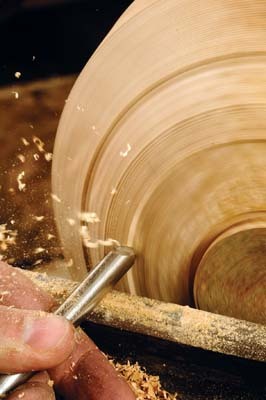 For clarity's sake, we will split this part of the series into two parts: this month we will concentrate on bowl turning, and next month on spindle turning. 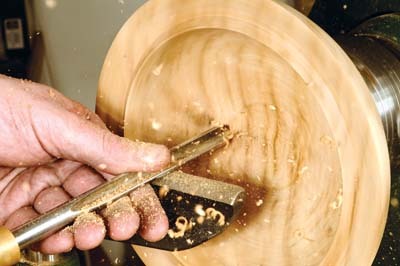 We'll show you how to use the tools for bowl turning as we shape a bowl ourselves, and will come back to finishing the bowl later in the series. 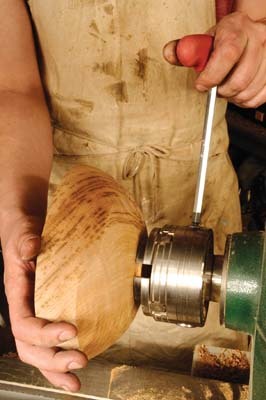 left-handed people need to buy a swivel headstock lathe for bowl turning, and reverse the tailstock/headstock position. 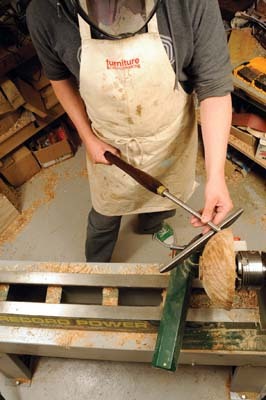 First of all, stand comfortably at the lathe with your feet shoulder width apart. 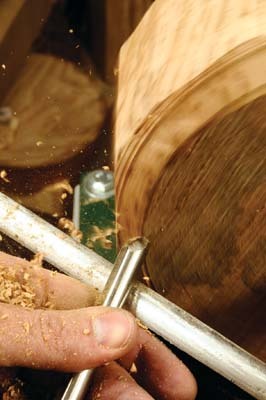 Grip the tool handle with your right hand, and hold this hand against your hip to support the tool. 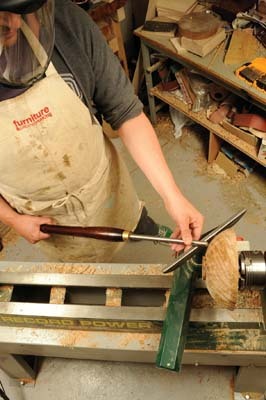 Next, place the gouge on the tool rest. 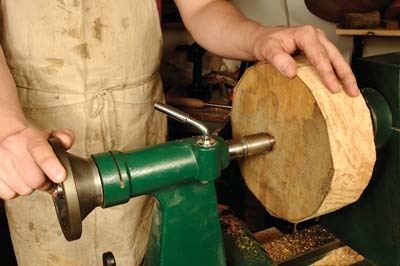 The tool rest should be positioned as close to the workpiece as possible without fouling it, and should be angled roughly in the direction of your cut. 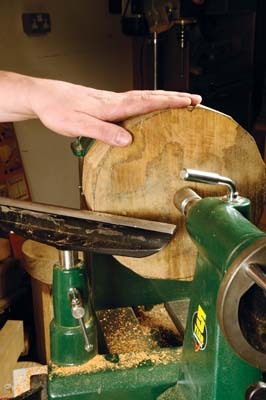 You can grip the tool on the tool rest with either an overhand, or underhand grip, as below. 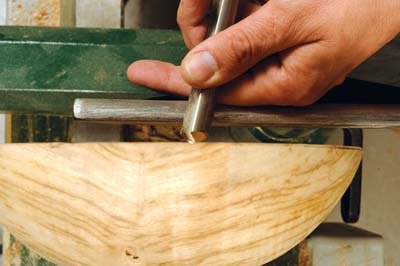 With both grips, part of the hand touches the toolrest to guide the gouge along. 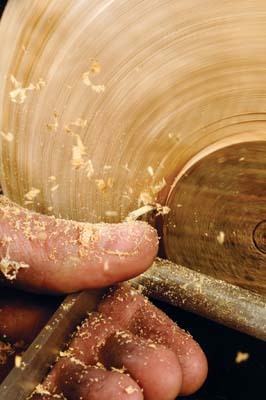 The choice of grip is down to you, but the overhand tends to provide more support, and the underhand grip more 'feel'. 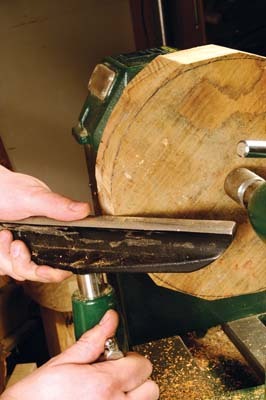 At the tool rest, the handle of the gouge is held a few inches lower than the tool rest, so the blade points upwards slightly. 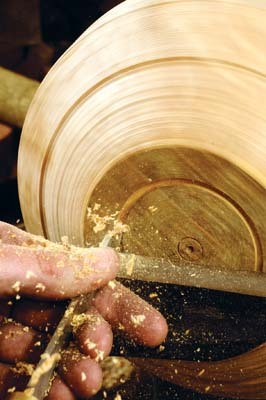 Turning tools are sub-divided into two types: bevel-rubbing and none bevel-rubbing. 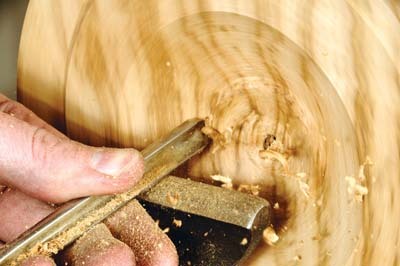 In the tools we'll show you here today, the bowl gouge and parting tool are bevel-rubbing tools. 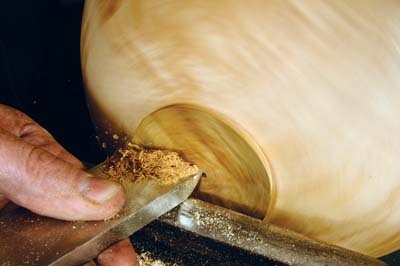 The term bevel-rubbing refers to the bevel that is ground onto the gouge to create the cutting edge. 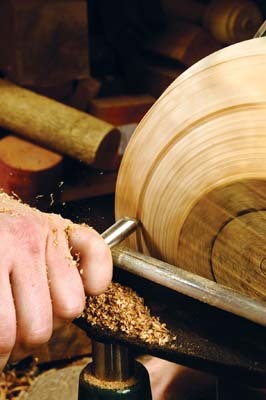 In practice, this means that the bevel rubs against the timber you are cutting, running behind the cutting edge. 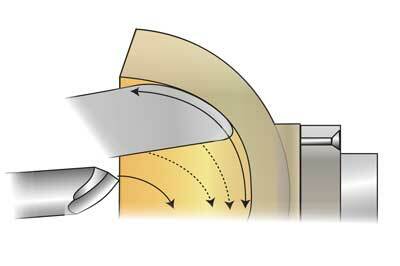 With the bevel rubbing, the cutting edge is better supported, creating a smoother, more accurate cut. 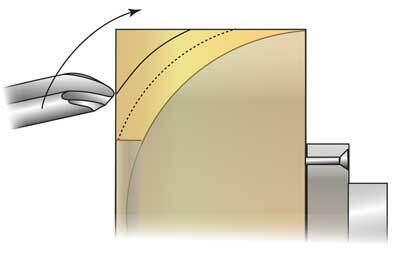 However, when making your first cuts on a blank, there is no workpiece surface for the bevel to rub against, so the gouge must be pushed into the workpiece in the direction of the bevel, so creating the rubbing bevel as the tool cuts deeper into the workpiece. 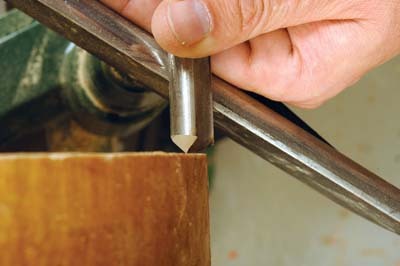 Once a reasonable cutting surface has been created, you can feel your way into starting a cut by holding the tool's bevel against the workpiece, and then lifting the tool handle slightly to start cutting, then pushing through the cut with the bevel still on the workpiece. 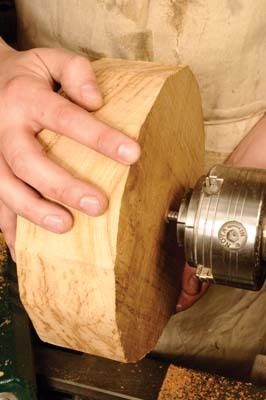 The first cut can be quite daunting, but hold the tool firmly and slowly push into the path of the timber. 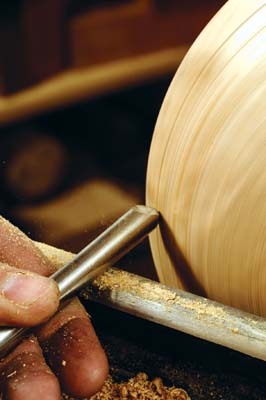 And be prepared for the tool bouncing if the edge of the blank is a bit lumpy. 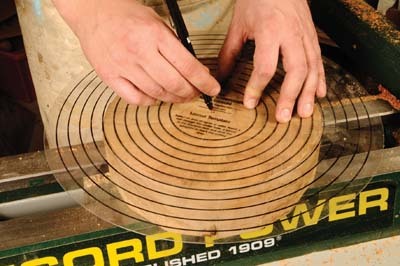 Your first task is to choose a blank - an ideal size is about 230mm diameter and 75mm thick. 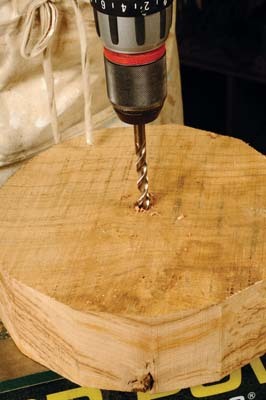 This is easy to fit to your screw chuck, and neither too big nor too small to make it difficult to turn. 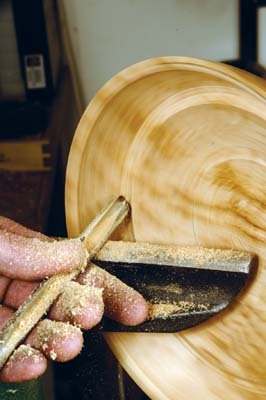 Bowl blanks are cut from the tree with the grain running across the blank - exactly where in the tree will determine the grain pattern. 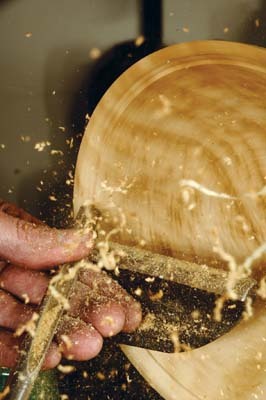 To get started, just choose a cheap blank with no defects and regular grain (see panel on timber selection). 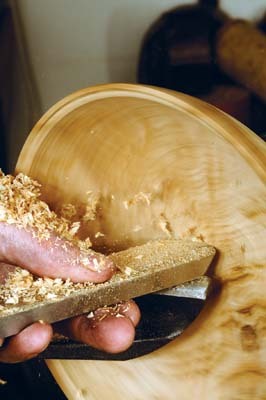 Effectively, when turning a bowl, you are making a series of cuts which reveal the shape of the bowl. 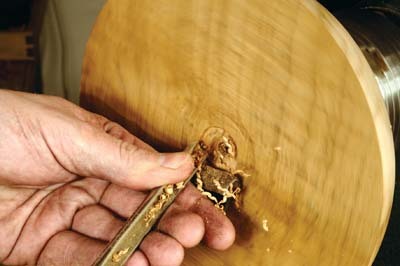 The gouge can only take off so much at a time, so you cut the timber in stages, both inside and out, as in the diagrams above. 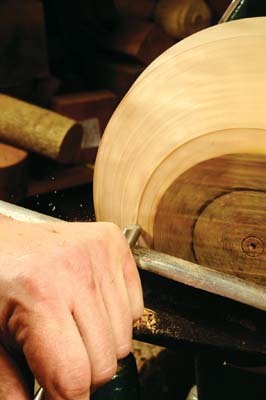 And there we are... the basic cuts for bowl turning with the tools required to create the shape. 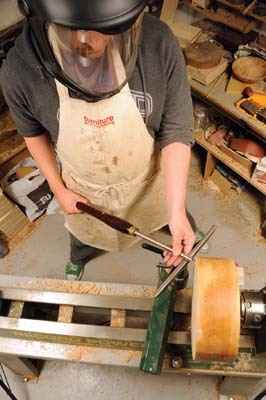 The main thing with turning is practice, practice and more practice. And take it easy. 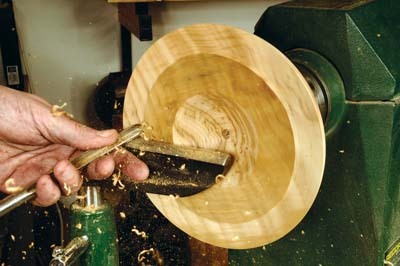 Take very light cuts at first until you are more confident. 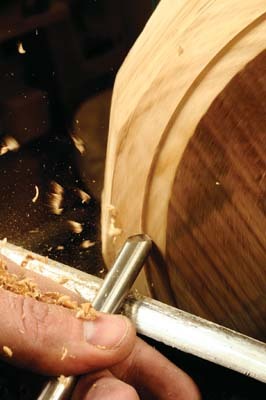 You will soon notice the right feel and sound for your best cuts. 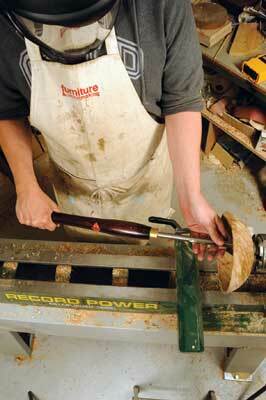 And don't forget to keep your tools sharp! 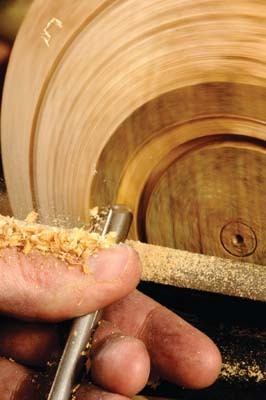 Depending on the timber, turning tools take a lot of hammering, so keep sharpening your edge, perhaps every half hour or so. 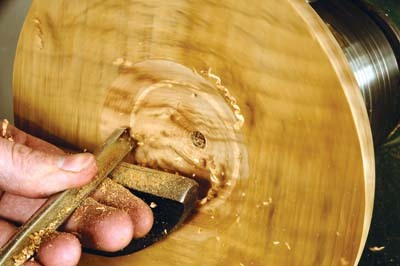 When cutting the outside of the bowl, as well as concentrating on the bevel rubbing, you must sweep the tool handle to the left, with a swerve of your body and arm. The motion needs fairly good co-ordination and practice, but will come with time. 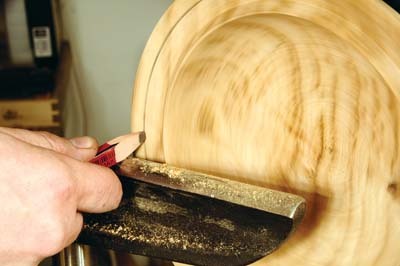 The idea is that you are keeping the cutting edge and bevel presented to the bowl surface at the same angle for as long as possible to have good continuity of cut, and therefore a good finish. 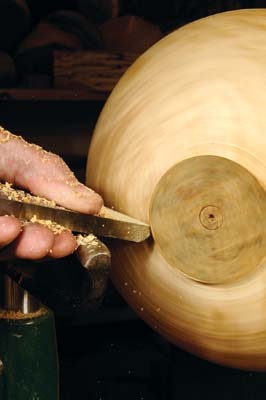 When bowl turning, the best way of getting started is with seasoned timber and pre-prepared blanks which you can get at many stockists. 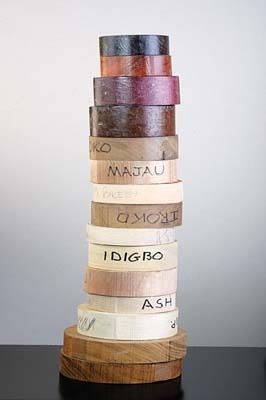 These have the advantage of being properly dried and sealed. 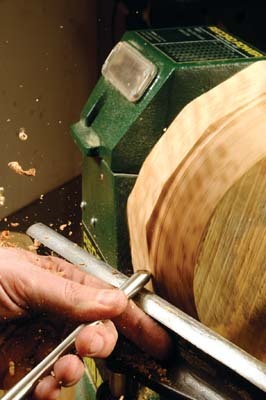 This will minimise the danger of blanks flying apart when you use them, and of excessive movement of the timber, both during and after turning. 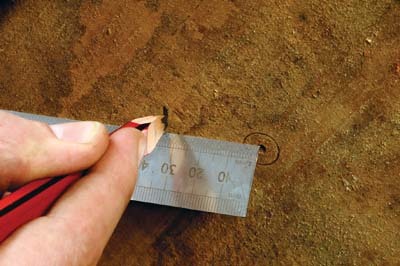 However, even with blanks you buy at merchants, it is imperative that you check for any splits, cracks, fissures, checks or excessive knots, as these can be dangerous when turning. As your skills improve, there are ways of dealing with these issues, but not to start with. 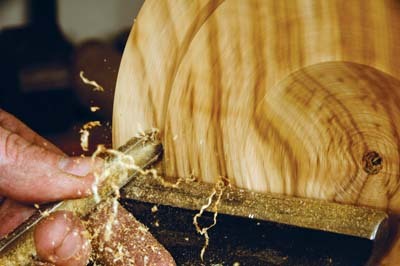 There are a great variety of softwoods and hardwoods that can be turned - good ones to start bowl turning with are close-grained dense timbers such as oak, ash, maple, sycamore, and fruitwoods such as cherry, apple, pecan and walnut. 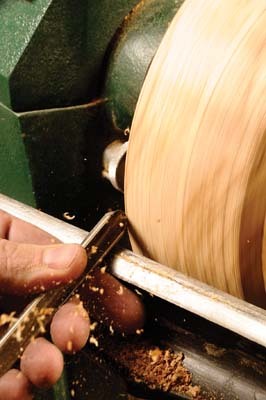 If you buy a seasoned blank, you will be choosing between air and kiln dried timber. 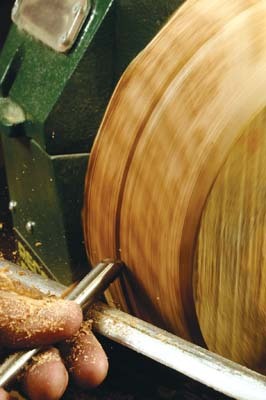 Kiln dried is likely to be more evenly dried to a lower moisture content, and better for getting started. 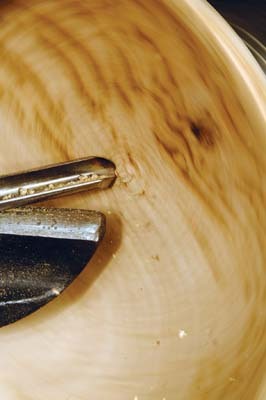 Air dried blanks may need further seasoning after you have bought it. 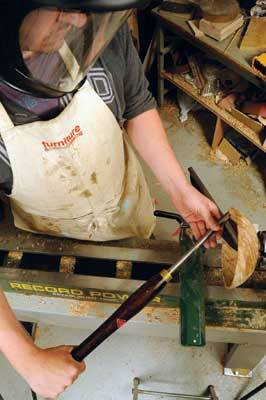 Overall, the thing is to minimise the risk of things going wrong, so seek the advice of your timber merchant.